If you have had the unfortunate experience of a family member dying recently, a wrongful death claim may be a way you can be compensated for this tremendous loss. 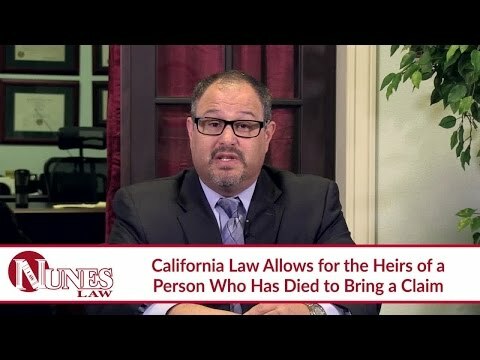 In California, the deceased person’s heirs, or their immediate family members or next in line to inherit, are able to bring this type of claim. In some circumstances, there can be others who can bring a claim, as well. After understanding who can bring a claim, it is important to know what can be claimed. Compensation for losses can include loss of companionship, society, comfort, support and economic support. There are many ways in which one’s death can affect the lives of that person’s loved ones. In some cases, a claim may also be able to be made for pain and suffering of the person who died from the time of injury to the time of death. Watch the video to learn more. If you have additional questions regarding your potential wrongful death claim, I want you to call me at (559) 436-0850. I welcome your call. Visit our educational website at https://www.nuneslaw.com for more videos and media content from our law firm.